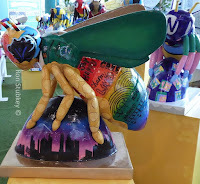 Now I am the first to admit that Manchester isn't the only city to have bees. Salford also has them on their coat of arms. So here are some more of Ron's bees from the Upper Mall of the Lowry ..... more to follow.